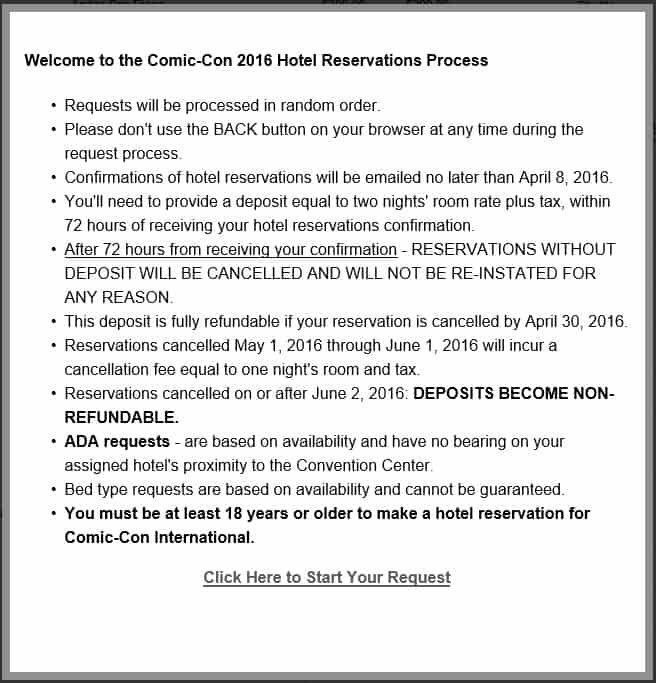 Welcome to our Guide on the San Diego Comic Con Hotel Request form for 2016! Comic Con International fights on our behalf each year in order to keep the hotel rates as low as possible for convention attendees. These hotels can be reserved by participating in either the Early Bird Sale (typically the hotels that are furthest away), or by waiting until OnPeak (CCI’s Housing Partner) opens up access to a hotel request form that includes the downtown hotels. This guide we will give you an overview on how the request form works, and highlights the changes new to this year. You will want to read the official FAQs and the BLOG regarding hotels before following this guide and using the test form. As this guide is fairly long, here is an index so you can navigate quickly. There are a limited number of rooms available near the convention center, and most attendees want to stay close. Therefore there is an extremely high demand for these rooms. The purpose of the form is to prevent a bottleneck of 200,000 people all trying to book the same few hotels as the same time. By making everyone fill out a form, OnPeak is able to slowly book each room at their own pace. This also removes the frantic situation we would all be in if they simply opened the floodgates and allowed direct booking of the rooms. The request form process makes it (mildly) less stressful to book a hotel for everyone involved. Before we get to the form itself, I need to highlight the big change this year. In order to combat against the mad rush of attendees that ultimately crashed the request form last year (See the SDCC Unofficial Blog post on the subject), OnPeak has added a queue. You can enter the queue waiting room on April 5th at 6AM (up to 3 hours before) the form goes live. At 9AM everyone in the waiting room is randomized in line and placed into the queue. It will be completely random when you are chosen to enter the form, but when your turn is up, you will be (automatically) redirected to the form. The hotels, can be booked by filling out a Request Form from OnPeak on April 5th at 9AM Pacific Time. A link to the hotel request form will be emailed to everyone with a Comic Con member ID a few days before the Form becomes accessible. 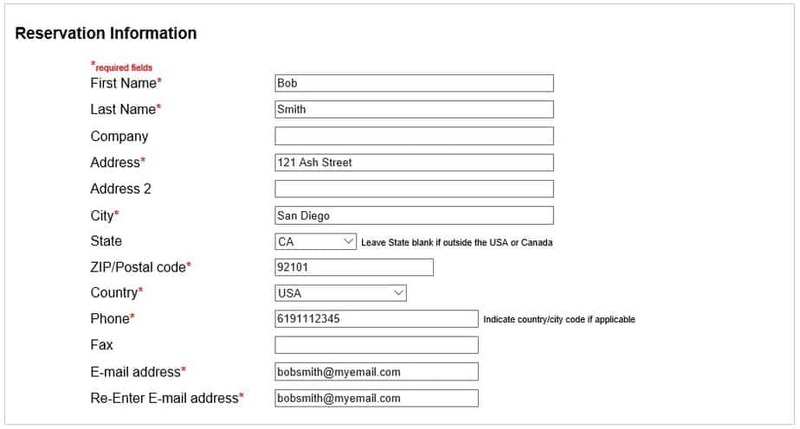 Or you can find a link to the form on http://www.comic-con.org/cci/hotels, likely the same day the links are emailed. The process is that you open the form at the designated date and time (Apr 5th, 2016 9AM PST most likely). You will then be redirected to the queue (or waiting room if you arrive early, and we recommend you do). Once you get to the front of the line you get redirected to the form and fill out the form as fast as possible. Enter your personal information, your top 6 hotel choices, guest information and then press the Submit button. A few days later you will receive an email with the hotel that has been chosen for you. You then provide a credit card that will be charged for two nights plus taxes. They process the forms in the order received, so the faster you are, the more likely you are to get one of your top choices. Kerry from the SDCCBlog.com (SDCC Unofficial Blog) got confirmation from onPeak over the phone that they will still be processing the form requests based on the time stamp of when the Submit button is pressed (timestamps within 3 seconds of each other are considered to have the same timestamp and are processed in random order within that group). This means that while the queue could spread everyone’s submission time out, your overall timestamp still matters. Click on the “Click Here to Start Your Request” link to close it. This is where the form starts. Fill in your personal contact information here. You have to use the dropdown selection box to pick exactly SIX hotels. you can re-arrange them by left-clicking and dragging the hotel name in the list that appears below the dropdown box. You can optionally check the box to “Accept an upgrade/higher rated room”. Then pick one of the six available waitlist options. Select the Number of rooms you are requesting (1 to 5). Set the room type for each room (single, double, twin, triple, or quad), And select the Arrival and Departure dates for each room. You are required to fill in occupants for each room. Check all three acknowledgement boxes and then press the Submit button on the bottom of the form. You’re all done! The rest of this guide will concentrate on the details of the form, and how to increase your chances of obtaining a (downtown) hotel booking. It is important that you understand what information is required in order to submit the form, and have all that information memorized NOW. You don’t want to spend time after the form goes live to track down critical required information. Determine which 6 hotels you want. Review the price list, and map, and read reviews on the hotels. The Form has as dropdown list of all of the hotels from which you can pick. Write down the hotels, with the exact spelling OnPeak is using, in the order of preference. You need to pick exactly 6, no more, no less. Make sure you have your personal information ready (notepad to copy/paste is great). Have the following information ready (either in a notepad,or just be really fast at typing). onPeak will process the forms in the *cough* *cough* order they are received. Thousands of forms come through every second. Forms received within 3 seconds of each other are considered to have arrived at the same time. At least that is how it is supposed to happen. So the faster you get your form submitted, the more likely your chances will be. Also, if you pick larger hotels that are not as popular, there is a better chance that when your form is processed, your hotel choice(s) will be available. It all depends on popularity of the hotel. If you are quick (and you get a lucky place in the queue), then it won’t matter. You can pick the Hard Rock, or the Hilton Bayfront and not have any problems getting your reservation. So..be FAST!! The closer to 9:00:00am you COMPLETE the form, the better your chances of getting a room you want. Don’t waste time reading or deciding on different options. Have everything planned out ahead of time. The is the first Section that requires typing. This is where you type in your name, address, phone and email I mentioned earlier. Again, I recommend copy/paste from a notepad document, unless you are crazy fast at typing. You can type the first letter to go hotels that start with that letter on the dropdown list. Makes selection go a ‘little’ faster. It seems to have trouble hopping down to a hotel that starts with the same letter of a hotel you have already selected previously (hope that makes sense). So be prepared to use the scroll bar to get to the hotel you want. The quicker and more accurate you are with the hotel selections, the better your chances will be to get one of the hotels on your list. If the only room(s) available at my specified hotels are at an upgraded/higher nightly rate, book my reservation into those room(s). NOTE: Nightly rates can be substantially higher than the rates posted above. Checking this box DOES NOT guarantee a room at your requested hotel(s). I am not sure what the criteria is, on whether or not you get offered a Suite, or other more expensive room. My guess is that if the hotels you chose are all out of normal rooms, yet they have some suites available, they may offer one to you. Prices for a suite can range from $600 to several thousand per night. We are not certain if this helps or hurts your changes of getting a standard rate room. The waitlist selection is where you choose what happens when your 6 preferred hotels have nothing available. Some options keep your original preferences in mind, and others open it up to all available hotels. I will describe each option, but it is up to you to choose what level of risk you are willing to take. Book me into any available hotel. NOTE: If we can book you into any available hotel, you will still automatically be waitlisted for your original, specified hotel choices. Book me into any hotel that is on the shuttle route. 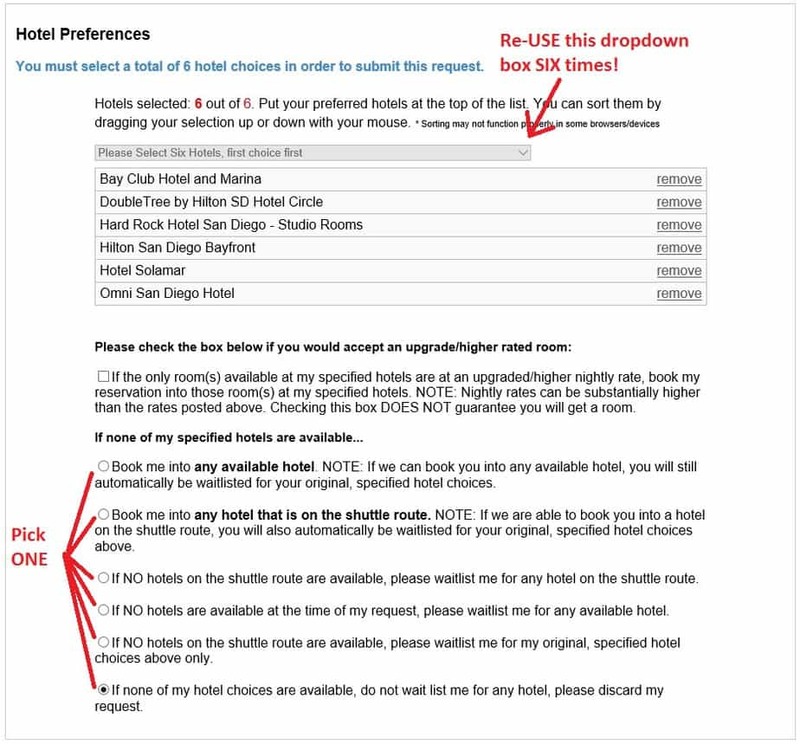 NOTE: If we are able to book you into a hotel on the shuttle route, you will also automatically be waitlisted for your original, specified hotel choices above. If NO hotels on the shuttle route are available, please waitlist me for any hotel on the shuttle route. If NO hotels are available at the time of my request, please waitlist me for any available hotel. If NO hotels on the shuttle route are available, please waitlist me for my original, specified hotel choices above only. If none of my hotel choices are available, do not wait list me for any hotel, please discard my request. When you select the Room Type, it will automatically add Occupants for each person that you are required to fill in. You will need to enter the first name and last name for each occupant (Do NOT JUST USE INITIALS!!). So if you pick “Quad” you will need to fill in a first and last name for all four occupants. Arrival and Departure dates are critical. If you try to ADD dates later, there may not be availability on the for the dates you need to add. It is better to book more than you need, and then reduce the number of days you need, than you find out later that you really needed to come in on Wednesday instead of Friday, and not be able to stay at the same hotel the whole time. The last section: acknowledgement confirmations. I will provide a deposit equal to my first and last night’s room rage and tax within 72 hours of receiving my hotel reservation confirmation email or my reservations will be automatically canceled. I understand the number of beds in a room cannot be guaranteed. You must Check all 3 check boxes, then press Submit. You should receive a confirmation email that your form was received. Within 48 hours you will receive the hotel you have been assigned (or the bad news that you did not get one, and that you are/are not on a waitlist for your original 6 hotels). You will then have 72 hours to pay two nights of the reservation or you will lose it. Now that you have a good grasp on what the form looks like, the information you need to memorize, and how to fill out the form… It’s time to make sure your time to complete the form as fast as you can. Practice entering all of your information (including selecting 6 hotels) over and over. Start a competition with your friends and family to see who is like.. the coolest form enter..er. yeah. Here is the link again to the sample form. Each year so far, some people end up with a reservation that they do not need for one reason or another. Travel Planners has thus far allowed us to transfer reservations to other people by calling them within the payment window (72 hours after the hotel confirmation emails are sent out). Rather than letting those rooms go back to the general population, we trade or give away the reservations to other members of our Friends of Comic Con community. If you have a hotel reservation you would like to trade for a different hotel (use reason/common sense), or would like to give one away, please visit our section dedicated to hotel exchanges. Also if you find yourself in need of a reservation after striking out in the Hotel Lottery, give the hotel exchange a shot to see if we can help you out. Keep in mind that most people are after downtown hotels, so try not to clutter the hotel exchange with hotel reservations that nobody will likely want. Thank you. To reserve your room, you will need to provide payment equal to 2 nights stay plus tax. You will receive an email from OnPeak with your reservation number, and a link to the website where you can confirm your reservation information, days, room type, and guests, and then submit your payment information. Once you have paid for your reservation, you will receive an email from OnPeak that includes your reservation number and hotel details. They will also include a link to the page where you can review and make changes to your reservation. This is the same page you used to enter your payment information. You can freely make changes to guests’ first and last names. But to change the billing address, Contact Name, or Phone number you will need to call OnPeak directly. Call onPeak at (877) 552-6642.